422 million people worldwide have diabetes, of which between 5% and 10% are DT1 (Melmed S, et al., 2011). Diabetes deaths will double between 2005 and 2040 (WHO). The size of the global market in 2017 is = USD 56 billion with a CAGR of 6.25% in 2018-2023. Eg the blood glucose test costs ~ £ 175 million / year for the UK national health service (NHS). The device is an artificial organ for delivering an adequate amount of insulin in response to selectable parameters recorded by a blood glucose sensor. 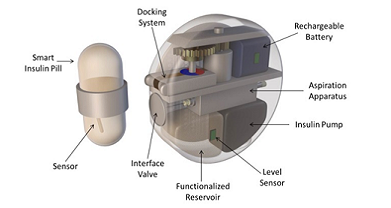 The device is rechargeable with ingestible capsules containing insulin. An implantable device for the controlled administration of insulin. It includes a unit for detecting a deficiency or excess of glucose in interstitial fluids, an infusion unit located in the peritoneal cavity, behind the stomach and near the duodenum, replacing or near the endocrine part of the pancreas. The infusion unit includes a control unit to process the data and generate a command for the release of insulin, but also includes the rechargeable energy generator via wireless. The system also includes an ingestible insulin carrier, made of pierceable material and resistant to gastric acids, with magnetizable metal parts, thanks to which it is conveyed and captured by the device. Following docking, a needle will drill into the transporter allowing insulin to be transferred to the storage unit and subsequently to the infusion subunit. Eventually the capsule is expelled naturally from the body through the digestive tract. The device can also work with other drugs, and for the treatment of other diseases.